From the Booker Prize–winning author of The English Patient comes a visionary novel about an icon of American violence. William Bonney a.k.a. "Billy the Kid," killed his first man when he was twelve. By the time he was twenty-one he had, by his own reckoning, slain nineteen more. In the intervening years he had become "Billy the Kid," bloodthirsty ogre and outlaw saint. 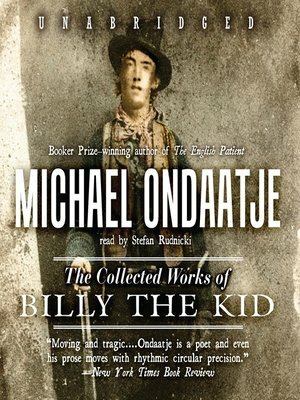 Drawing on contemporary accounts, period photographs, dime novels and his own fund of empathy and imagination, Michael Ondaatje imagines Billy's passage across the blasted landscape of 1880s New Mexico and the collective unconscious of his country. The Collected Works of Billy the Kid is a virtuoso synthesis of storytelling, history, and myth by a writer who brings us back to our familiar legends with a renewed sense of wonder.